There is a huge demand for Filipino farm workers such as mushroom pickers in Canada because agriculture sector there is booming. Salary offer for the job is also high that can reach up to 150,000 pesos or around 3700 Canadian dollars per month. 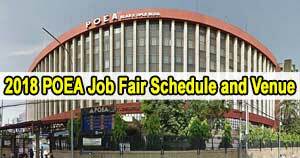 Unfortunately, the said position has NO JOB ORDERS yet according to POEA. 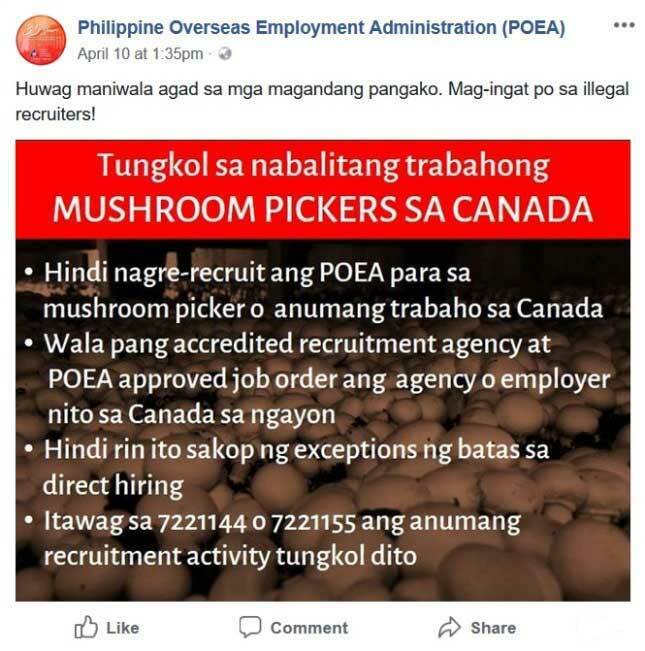 This just means that Filipinos residing in the Philippines cannot apply and work as a mushroom picker in Canada. DIRECT HIRING IS NOT ALLOWED, and there is no landbased manpower agency in the Philippines that is hiring skilled workers for the said position. POEA warned the Canadian employers and interested applicants to undergo the correct process when comes to hiring, and working respectively, for the position. To be able to hire Filipinos, Canadian employers need to acquire accreditation from Philippine Overseas Labor Office (POLO) CANADA branch. They also need to coordinate with a POEA accredited recruitment agency in the Philippines that will facilitate the screening and hiring process for the position. Mushroom picker positions are “vulnerable” employees that need assistance from POEA to see to it that the level of protection while at the job site is assured. Level of protection means that the employment provision will be guaranteed and complied. There must be a mandatory insurance, and repatriation should also be covered. 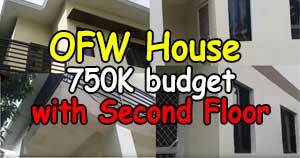 To enjoy these benefits, applicants must process the application through a legitimate manpower agency. According to POEA, in the recent years, there are 72 workers in 2016, and 80 workers in 2017 who were able to work as a farm worker in Canada. Among the hired workers, 14 were mushroom pickers. The reason is that these employees undergo a recruitment process from an accredited manpower agency in the Philippines. 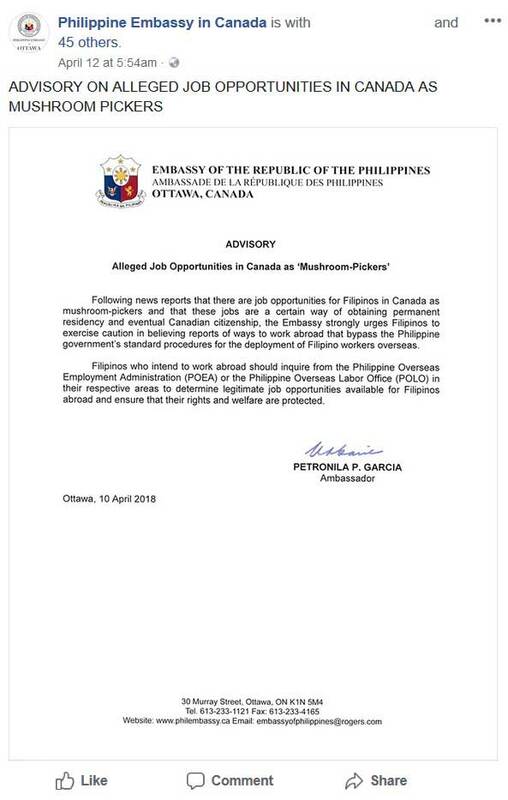 Following news reports that there are job opportunities for Filipinos in Canada as mushroom-pickers and that these jobs are a certain way of obtaining permanent residency and eventual Canadian citizenship, the Embassy strongly urges Filipinos to exercise caution in believing reports of ways to work abroad that bypass the Philippine government’s standard procedures for the deployment of Filipino workers overseas. 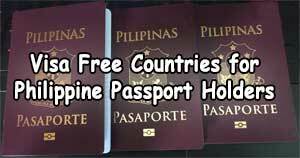 Filipinos who intend to work abroad should inquire from the Philippine Overseas Employment Administration (POEA) or the Philippine Overseas Labor Office (POLO) in their respective areas to determine legitimate job opportunities available for Filipinos abroad and ensure that their rights and welfare are protected. I want to try and learn on how to pick a mushrooms. I want to experience working in abroad.